Hard work is being done to finish the website. Like to know more or receive update info? Click here to send an email with your details. Modds for your computer case side panel. A custom designed window for any personal computer side panel. Clear glass or colored glass window. Glass with a beautiful -one off a kind - print. Design your own print, or let us design it for you. Pick your favorit image and have it printed on your new glass window. Available in different size-ranges and shapes. Replace an acrylic window with a custom Chill-r glass window. Enhance the effect with matching Cable sleeves and Led Lights. 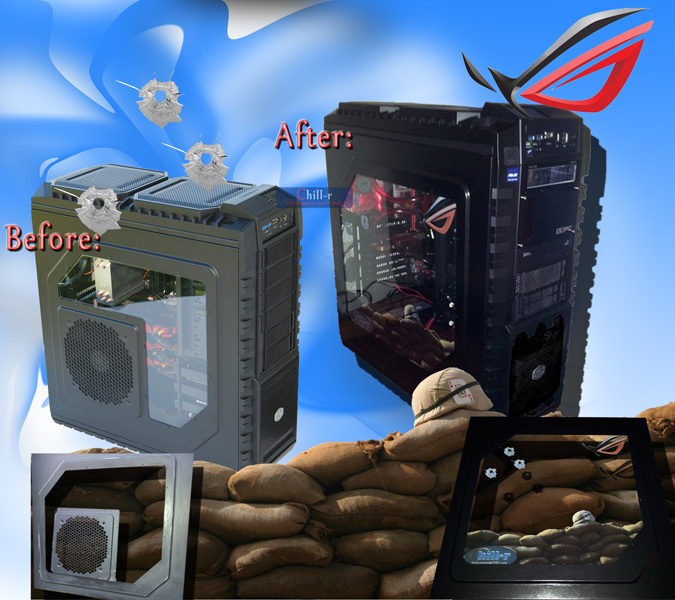 Ever thought about Modding your PC? 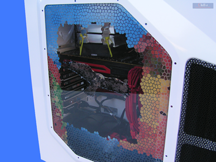 Are you a Pro Modder or new to modifying your PC Case? Want to give your PC the ultimate, unique and personal finishing touch? Do you want to showcase your Hardware? Want to give your personal computer a real cool design? Like to reduce the noise level of your PC? Want a PC with a beautifull design? The ultimate creative solution to finish off any PC build! Fully customizable Glass Window for the Side Panel of your PC Case. Glass that gets Printed with the Design to your liking! Think of something Creative and give your PC Case that extra bit of yourself! -Your New Work of Art - No more boring designs! Use LEDs or Cold Kathode Lights to maximize the Effect! Sleeve your cables in matching colors! Are you looking for a window? Chill-r produces a high quality glass window for -almost- every pc case. We are sure that we can meet your wishes. You can use a glass window on any PC side panel door. If the Side panel of your Case already has a side panel (mainly acrylic materials), you can replace the existing window with a custom glass printed version. 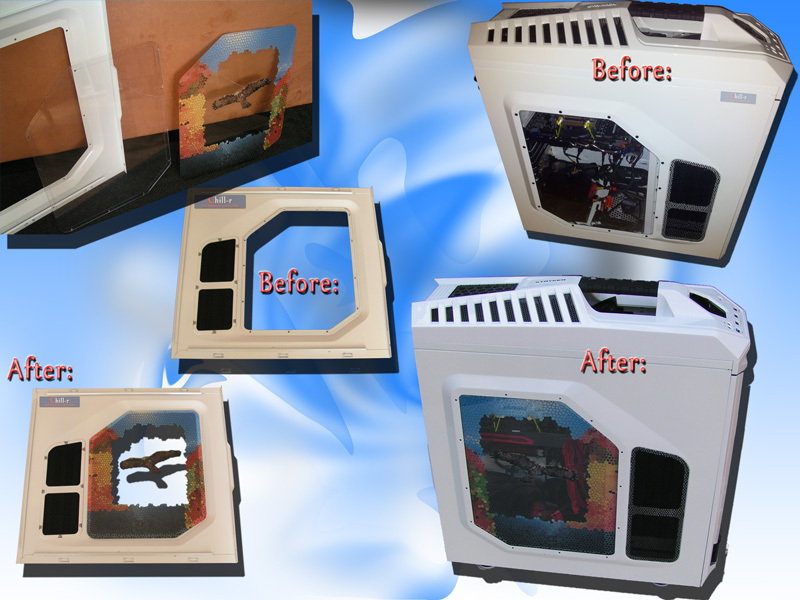 If you have a PC Case that is not equipped with a window you can modify your steal side case panel **. Pick the shape you would like and use a cutting tool to make room for a window in the steal side panel. You can opt to fix the Window on the inside of the case panel or on the outside. For side panels that have been cut and are visually not nice to look at we recommend fixing the panel on the outside of the case. We can print a margin all around on the glass so you will not see the cutting edges. We have pre-defined a set of window sizes and shapes. Suited for desktop PC’s ranging from mini tower, midi tower to full tower. Does your case have a factory (acrylic) fitted window? Chill-r can make an exact copy of that window, as a replacement for the standard window. On top of the predefined Shapes and Sizes there is also the possibility to create a custom shape. For example the glass panel designed for a Cooler Master HAF X, where the side panel has been modified to fit a Custom Window. The Shape and the size are custom ordered ****. The height and width of the Window. The shape: rectangle, box or even round. A printed margin all around (to mask jagged edges after cutting in steal side panels). Gamers, PC modders, overclockers and tweakers have one thing in common: the love for their personal computer (PC). A lot of time and effort is done to make, build, mod, design and tweak the personal computer to personal needs. An important part off the look of the computer is the pc case (also referred to as a computer enclosure or chassis). Computer cases/chassis can be used and or bought as: gaming computer cases, custom pc cases, benchmarking cases, watercooling cases. Water cooling is often an extra reason to showcase the inside of the computer. 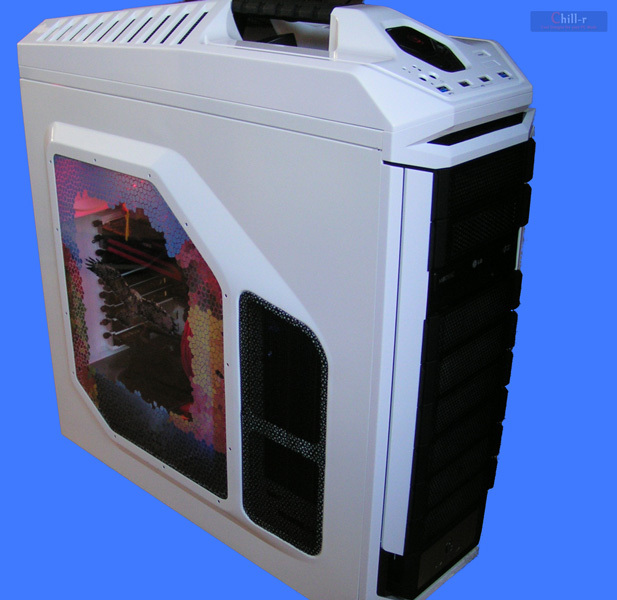 PC cases and the hardware inside are often adjusted to personal wish or need, this is known as pc case modding. These computer mods depend on available computer accessories or have to be modded by hand. 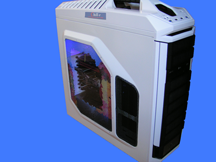 PC Cases or enclosures can be divided into categories or types. Types, which are mainly determined by the height, can be split up in the following ranges –which are differently named depending on the manufacturer: Mini ITX, Mini Towers, Mid Towers, Full Towers, Ultra Towers, desktop, HTPC, Server cases. However there is no real standard naming convention. Another way is the dividing the PC Cases/Chassis/Enclosures by the motherboard size, which has been standardized as form factor size (more information and full list on wikipedia). Among these are : microATX (or µATX), ATX (sometimes referred to as standard ATX) and Extended ATX. 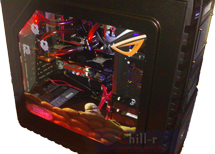 Cool Master; like the coolermaster HAF, CM Elite, Centurion and Cosmos series and the Cooler Master (CM) Storm series. Corsair cases, for example the Corsair Obsidian cases Corsair Graphite series, the Vengeance Series and the Carbide series. Antec with case series: Enthusiast, performance (one), and gamer cases. Fractal Design: with the Define R4 series, the ARC mini and ARC midi series. Lian-Li cases, like the PC-8NWX. Thermaltake: like the Chaser Snow and Thunder Edition, the V-series, the Spacecraft, Chaser, Commander, SD and Overseer Series Cases. The size: does all the hardware fit in the case? How much room is available for placing the case? Usage: does the PC motherboard, Central Processing Unit (CPU or processor) and or Graphic Card (GPU) generate a lot off heat? For example heavy gaming PCs, overclocking rigs or PC’s for graphic designers. Possibility off installing a water cooling set, with water blocks for the CPU (processor water block), the GPU (water blocks for Graphic Cards), motherboard blocks (Chipset blocks) and even RAM water cooling (water blocks for the memory sticks). The placement of the water cooling pump, the reservoir (sometime reservoirs with pumps and last but not least the Radiator. Radiators ranging from 1x120 mm to 4 x 140 mm and even beyond that. Is the case a windowed version (i.e. does it have a side panel with a window) or can you buy a window kit for it. Can the case be modified easily? 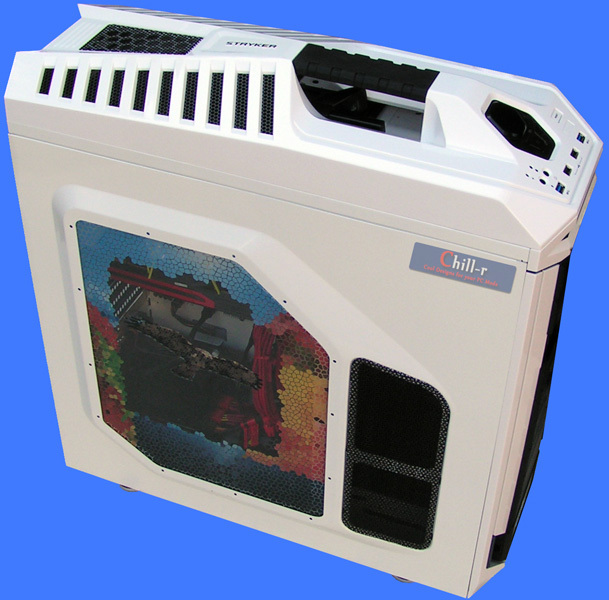 Case modders are known for their creativity, mods can range from small to large case modds. The level of noise that is emitted by the case; this is the accumulative of the hardware inside. The material: cases are being made in: acrylic, aluminium, polyester, steel and a lot more is possible. Printed glass window for the side panel of a computer case. 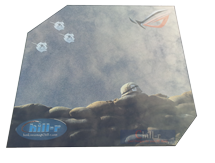 A special print: 3 bullit holes, the ROG logo and a stack off sandbaggs with a helmet*. A finished custom modded CM HAF X Case. Printed glass window, modded side panel, custom watercooling set and special LED lights. 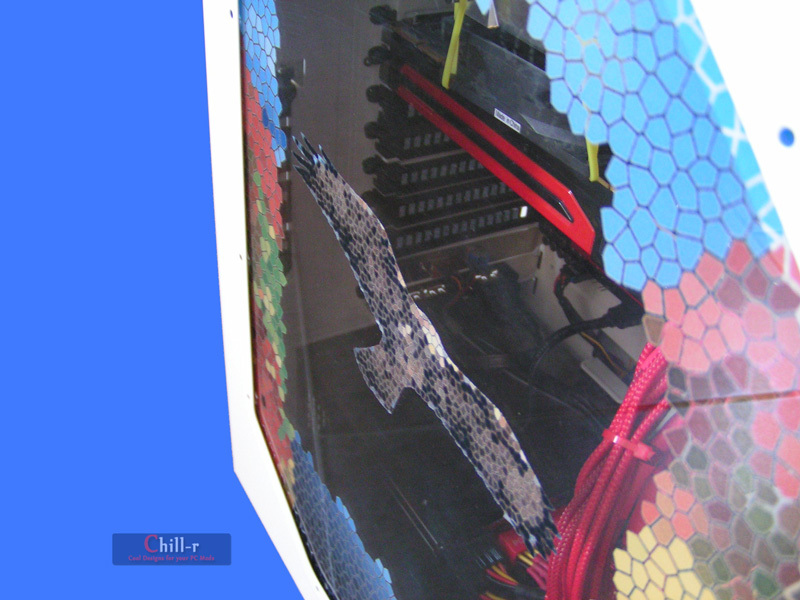 This is A Cooler Master Storm Stryker Case with a custom designed - stained- glass window Project "Bird of Prey"
A closer look at the glass - nice detailed print -. Using a thermal printing methode. This print was design by Chill-r, but you can choose your own print.